He went 0-for-3 with a walk, but Richie Sexson's defense was key to stopping two budding Cook County rallies. He dug a Brian Roberts throw out of the dirt to complete an inning ending double play in the fifth and he made two nice backhanded catches on line drives in the seventh -- both with a runner on. It's easy to forget good plays when Roger Clemens is throwing darts, but Sexson's plays were big in game four. 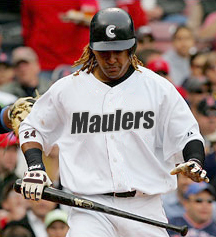 It seems like Manny Ramirez hasn't had a good swing all series. After walking in his first at-bat, he struck out twice and grounded into an inning-ending double play. He didn't have a bad game, but he didn't do much to help his team win, either. Rafael Furcal gave his team a spark by running through a stop sign and scoring on Roberts' sharp single in the top of the third. Cook County had scored to tie the game in the second, but Furcal caused all kinds of problems in the third. He walked, stole second base, and scored on a gutsy play and a great slide to avoid Toby Hall's tag. As great as Clemens has been, the Maulers have to hope to see him again. They need to beat Pedro Martinez and Andy Pettitte to force a Game 7 showdown with the Rocket. Dan Haren takes the mound for Cook County, hoping to repeat his Game 2 magic. COOK COUNTY -- Game 4 wasn't just a rematch of Game 1 starters Roger Clemens and John Patterson, it was nearly identical from start to finish. Clemens again threw a complete game and the Avengers again beat the Maulers by an identical 5-2 score. Clemens had the Maulers on their heels all afternoon, collecting ten strikeouts against only two walks. He did allow eight base hits, but the Maulers rarely strung baserunners together and struck out too often to move runners along with productive outs. "I pretty much threw fastballs, but I tried to move them around, in and out," said Clemens after the game. When asked about his heavy postseason workload, Clemens said, "Hey, I've been doing this a long time, so 115 pitches isn't a problem anymore." Patterson had his great curveball working, holding Metropolis to four hits as he worked into the sixth inning. Unfortunately, he didn't always know where that curve was headed, as he was hurt by three walks and a hanging curveball that Eric Chavez hit for a solo homer in the second. "Yeah, it kind of floated, I guess. He still had to put a good swing on it, though," said Patterson of the Chavez homer. Cook County quickly tied the game in their half of the third. Andruw Jones greeted Clemens with a triple to the right field corner on the first pitch of the inning. Two pitches later, the game was tied, compliments of a Chipper Jones sacrifice fly to center. Andruw Jones was looking for a fastball to drive on the first pitch. "He likes to get ahead, and I was looking on the outer half. That's where he put it, and I hit it." Not wanting Cook County to get too comfortable, the top of the Metropolis order combined for two more runs compliments of a little small ball in the fourth inning. Leadoff hitter Rafael Furcal forced a one out walk and then stole second easily. Brian Roberts, found himself in an 0-2 hole after taking two hittable pitches to allow Furcal to steal the base. Roberts still got a pitch to hit, depositing a fastball into shallow left field for an RBI single. He quickly followed Furcal's lead, stealing second without a throw from catcher Toby Hall. Roberts tried to explain his baserunning strategy after the game, "with our lineup Raffy and I don't look to run. We don’t not look to run, either, if you know what I mean." The two combined for 57 steals on 67 attempts during the regular season and are a perfect 8-8 in the postseason. The middle innings were fairly quiet, though Cook County did put a pair of runners on in the third and fifth innings. In the third, Johnny Damon and Tony Clark singled, but Andruw Jones hit a soft liner to Furcal to end any threat. In the fifth, Maulers cleanup hitter Manny Ramirez came to the plate with runners on first and second with one out. One of the best hitters in Brassball history, Ramirez slugged 49 homers during the season, racking up 117 RBIs. He's been ice-cold in the World Series, though, and Clemens induced a weak ground ball to Furcal for inning-ending double play. The slow grounder was a tough ball on which to turn two, and Richie Sexson made a great scoop of Robert's throw to finish the play and end the rally. Maulers manager Kevin Kolb retained confidence in his struggling superstar, saying, "Manny's fine. He's gonna turn it on, we all know it." With rookie phenom Felix Hernandez warming up, Kolb sent Brandon McCarthy out to start the seventh inning. Still down 3-1, the Maulers were running out of time and needed to keep their deficit at two. McCarthy looked strong, quickly getting ahead of Wells 1-2. After three foul balls, Wells brought the count even and then pulled a 2-2 fastball down the left field line. The ball looked like it wanted to go foul, but it stayed straight as an arrow, easily clearing the fence and padding the Avenger lead. After getting three outs on sharp line drives in the seventh, Clemens looked to be tiring. He turned on the gas to start the eighth, though, striking out Ramirez and Tony Clark on fastballs up in the strike zone. Clemens kept up the strategy with Andruw Jones, who obviously watched the prior at bats and jumped on a belt-high fastball, driving it for a long homer to straight away center field. Unfazed, Clemens through four more fastballs to Chipper Jones, who grounded out to on a check swing. Chipper was impressed with Clemens' stamina. "He was still throwing hard. It's the eighth inning and he was in the mid-90's, for sure. Not many guys can do that." Game 3 hero Melvin Mora led off the Avengers' ninth with a homer off Hernandez, who had relieved McCarthy. With the bottom of the Mauler lineup due in the ninth and Clemens still looking strong, some of the hometown fans started for the exits. Clemens finished off his third complete game in the playoffs by retiring Jhonny Peralta, Chase Utley, and pinch hitter Bill Hall in order. The Avengers hand a 3-1 series lead to Game 5 starter Pedro Martinez. The Maulers counter with Game 2 star Danny Haren. Despite their 3-1 hole, Maulers right fielder Damon isn't ready to throw in the towel, "How many games did we win? More than a hundred, right? I bet we won three in a row at least once." A self-proclaimed "idiot," Johnny Damon has never been one to take the "half-empty" view of baseball or life. After Game 4, he asked "how many games did we win?" (105) and then guessed that they'd won three in a row at least once (15 times, actually). What Damon didn't ask was how many games Metropolis won (114), or if they'd lost three in a row (three times). What's interesting is not that Metropolis got swept three in a row at Fleetwood in June, or that they lost six in a row that same month (five to Maine, one to Tinley). No, what's really interesting is the three games Metropolis lost in a row in late April. To the Cook County Maulers. This thing isn't over, yet. Hot ESPN Searches: Vote: BRASS Awards | Free Agency Preview: Will Pujols leave Glen Allen? Hot Multimedia Searches: Cleveland Champions sound off | Todd Dunwoody still asking for "love"
We lovingly lifted this page design from ESPN.com. It is for entertainment purposes only.